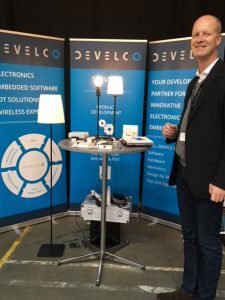 Develco participates at stand number 81 at the fair High Tech Summit on the 10th to 11th . October 2018 at DTU in Copenhagen and exhibits various developed products and solutions. For the smart home Develco has developed the Anyware Smart Adaptor™ – a small, complex and multiple featured device. The adaptor functions as a light dimmer, monitors the indoor climate in your home and can be used as an intrusion alarm. With WiFi, Bluetooth and the Anyware Home App™ on the smart phone the consumer can measure light, temperature, humidity and sound. All data from the sensors in the discreet and elegant adaptor are sent to the Cloud. For many years Grundfos has had a leading technological position within pumps and with the gateway Grundfos Connect Box G501 – an IoT solution developed by Develco – Grundfos has also taken the lead in the service section. The Connect Box G501 can easily and safely connect Grundfos pumps and systems to GRM Grundfos Remote Management system. GRM provides Grundfos with access to big data on all monitored systems and thus, a valid analytical basis for optimization of both services and pumps installed in e.g. commercial buildings, water supply networks and sewage systems. The Municipality of Frederiksberg has become a smart city collecting household consumption data sent to a cloud solution for analysis of big data and optimization of energy consumption. Frederiksberg Forsyning delivers water, heating and electricity to the Municipality of Frederiksberg and has co-operated with Develco concerning the development of a smart city solution. The project comprises more than 1000 gateways suspended in the street lightning and connected wirelessly to heat and water meters in the individual households. The gateways are PoE connected to a network of Access points to cover collection points for consumption data. Frederiksberg Forsyning has got access to real-time data allowing for better and more precise regulation of district heating and water supply and savings in operating expenses. The smart city solution in Frederiksberg Municipality has a positive impact on the environment and contributes to sustainability.